As of March 17 our ground is bare with excellent cover. With winter in the Champlain Valley having been generally mild we were able to hunt through, residual birds are plentiful in fields of corn, milo, switchgrass and native grasses offering both holding cover and feeding areas. You will find the hunting to be great right now and should continue through April. We are currently offering Chukar which can be added to your pheasant hunt package. If you have not visited us since October, you will see that we completed many projects in 2018 and the one we are most excited about is the new Club House or "Warming Hut" pictured below. We no longer have to thaw writing pens out before you sign in, or thaw dog water out over the stove. We have a comfortable, well lit sitting area heated by a pellet stove, along with gun racks, dog cages and plenty of room to change jackets or boots. The new building is a wonderful addition to the Peaceable Hill facilities. Please note we hunt each day and we will be open through the end of April. 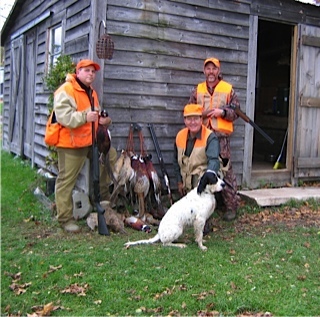 Our morning hunts are from 8:30 to 12:00 PM while the afternoon hunts are 12:30 to 4:00 PM. Please plan to arrive at the home farm 1/2 hour prior to your start time. (8 AM or 12:00 PM) We respectively ask that you do not arrive early as that may cause conflicts with earlier hunts or farm operations. Cancellations must be made at least 24 hours prior to your hunt date. Thank you for your attention to this schedule. We welcome you; your family and friends, to what we are convinced will be a grand hunting season. We look forward to seeing you soon! 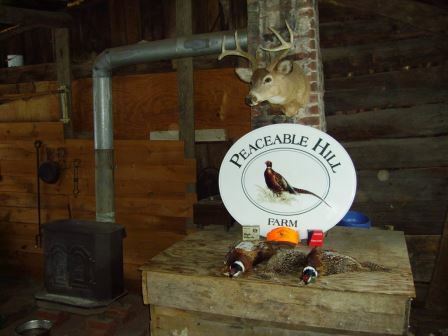 Peaceable Hill is managed exclusively for prime bird habitat and bird contact is what we are all about. 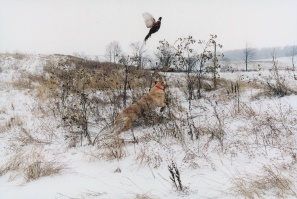 Whether you are training a young pup or challenging an experienced brace, the combination of cover, bird contact and the surrounding beauty will satisfy all your senses. Loud cackling Ringnecks, strong and flashy, blasting off from under the nose of a tight Pointer, or a birdie Flusher bumping a skittish hen, is the experience you will not easily forget! Our goal is to provide you with an outstanding experience and we have the desire and ability to customize a hunt to your needs. 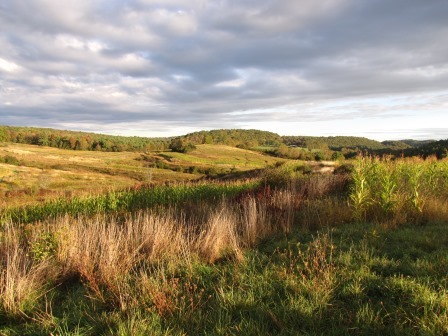 We have spectacular fields and open cropland habitat which allows excellent visual reference for training a young pup, as well as secluded areas where distractions are minimal. 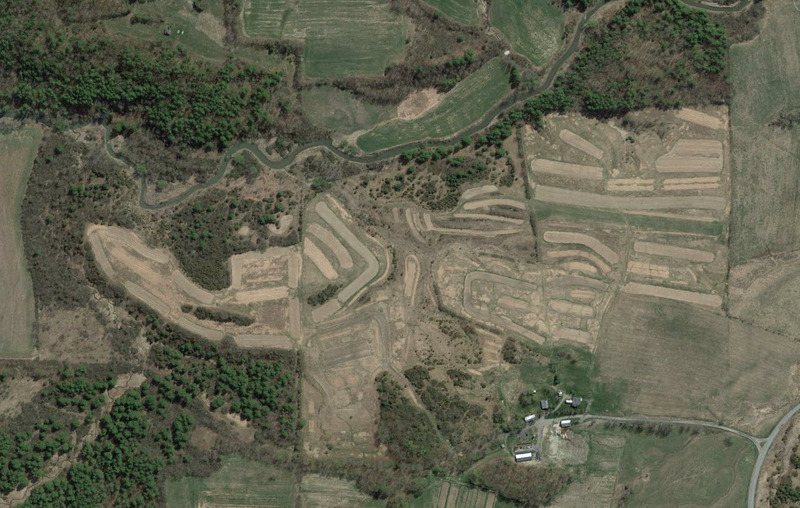 We plant fields of grain sorghum (Milo), corn, perennial switch grass and reed canary grass. Crops and planting arrangements are planned in order to establish nesting cover, feed plots and challenging cover. Our natural and planted covers make for outstanding hunting the in the fall and hold up very well through the winter. We have fantastic hunting right into the month of May. 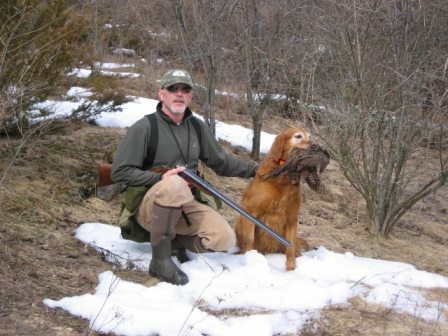 You are welcome to hunt with your dogs, or we can arrange a professionally handled hunt with experienced guides working over trained pointers or flushing dogs. 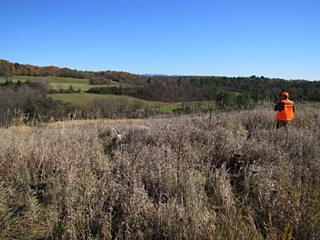 For those of you visiting Vermont who would like to hunt with us, single day hunting licenses are available for $5.00. 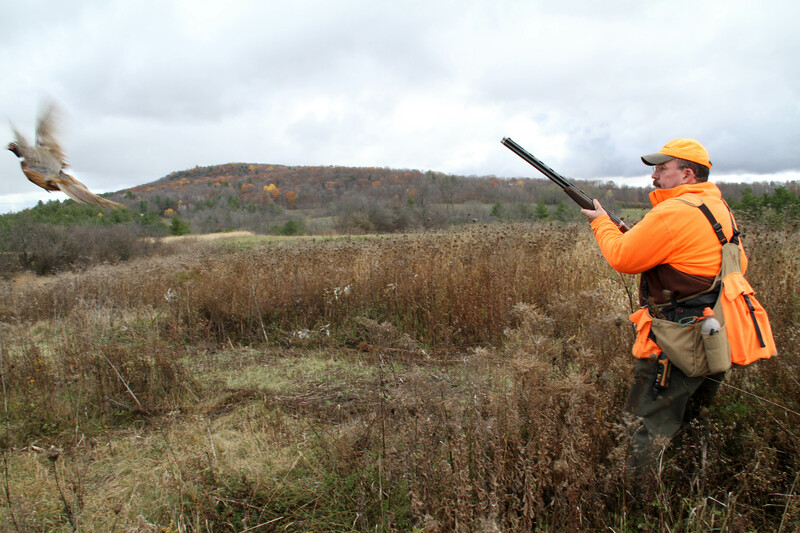 To obtain a one day Vermont license, you must have a current hunting license from any state or you have had a previous hunting license. You also can get a license if you have completed a certified Hunter Safety course. 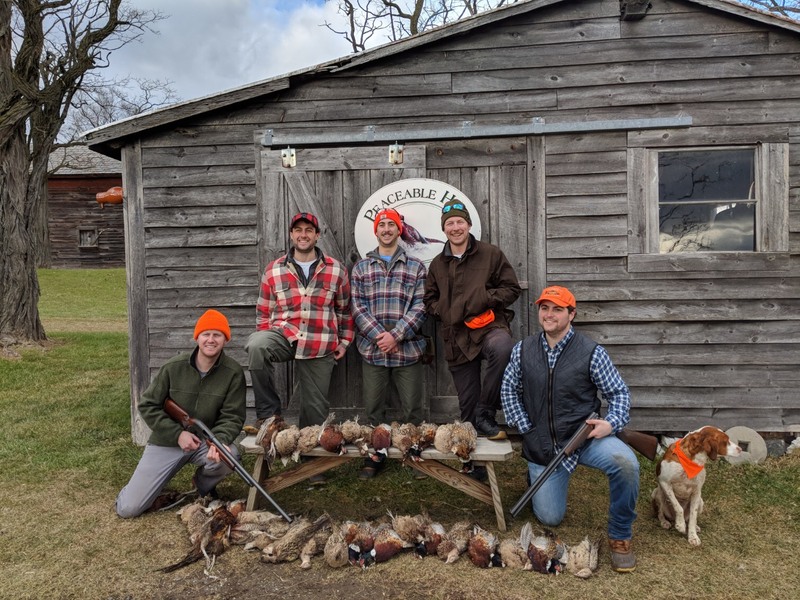 Whether you are a single hunter looking to train your new pup, or if you have a large group and need an all-day guided hunt, we can accommodate you. Please call anytime for further information, references or to book your hunt. Same day reservations are always welcome based on availability. Again, thanks for visiting our web site and please let us know if we can answer any questions for you.